One of the questions that often comes up with regard to my studies in iaido (the art of drawing the sword) and Nihon buyo (Japanese classical dance) is whether there is any element of creativity involved in these very traditional art forms which feature highly stylized timing and movement. Both are based on the study of kata, usually translated in the West as "form." However, the English word "form" does not begin to explain the complexity of what kata actually is. Kata, especially in non-sport martial arts, are patterns of movement which embody techniques and stylistic elements of a particular art form. 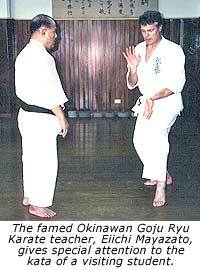 Some older martial arts forms consist almost entirely of kata, with little "freestyle" movement. Kata has been a traditional tool for teaching martial arts in Japan for centuries and is also prevalent throughout Japanese traditional arts including, but in no way limited to, flower arranging, tea, traditional Japanese dance, and the kabuki and noh theaters. This article is in part entitled "bound flow" so as to be able to draw on the insights of Rudolph Laban (1879-1958), a pioneer in movement analysis. Laban developed a system that could be used, he hoped, for all observable movement. Eventually, his "Labanotation" was used extensively for dance and choreography (1). "Flow" was one of Laban's elements of analysis. It is defined as motion produced by a single effort, or impulse to move, but which can be variously bound, or controlled, depending on its function. Laban felt that more tightly bound flow is more task-oriented and is associated with labor. Less "bound," or freer flowing movement is associated with emotional expression, that is, with more creative impulses. At its most "bound," there is no visible movement at all. "Bound flow" refers to movement which is held in check by certain parameters, for example ballet or other highly codified choreography. Since I study both martial arts and Japanese classical dance, "bound flow" has a great deal of significance for me. To the untrained eye, both iaido and Japanese classical dance forms look much more "bound," than "flowing," or you might say, more like work than self-expression. To be able to discuss creativity and how it relates to expression of both martial arts and other Japanese arts, it is useful to examine research in this subject. The "ura" (or hidden) meaning of my using "bound flow" in the title of this paper has to do with the works of psychologist Mihaly Csikszentmihalyi, whose most recent book, "Creativity" (1996), provides some theoretical underpinnings for discussion. "Creativity" examines the achievements and characteristics of highly creative people, "with a capital C" -- those who came up with some innovative technique or strategy that is recognized within a particular domain of study, and is further recognized by what the author refers to as "the field", that is, already recognized experts in a particular area. This new discovery or approach then changes the domain of study from that point on. The study was based on interviews of a spectrum of well known scientists, business people, artists and writers, including several Nobel Prize winners. While there are problems applying this criteria to indigenous Asian art forms, there are nevertheless at least some facile similarities that can be suggested with regard to some koryu (pre-17th century) martial arts which still exist today. Csikszentmihalyi notes that "creative with a capital C" individuals are not contained in vacuums. Without exception, all of his interview subjects are steeped in their chosen domain of study, and have spent many hours training in it. The archetypal founder of a koryu is usually depicted as a seasoned warrior who spends several days or weeks in a Shinto shrine or other sacred place, without food or water, deep in meditation. At the end of his ordeal, he emerges in possession of a divine vision of what the new art form should be. He thereafter spends years refining and perfecting his system. Only after this period of development is it passed on to a small group of disciples. These subsequent teachers add their own insights, some occasionally developing new styles altogether, others evolving and preserving the founder's art form through successive generations. In spite of obvious cultural differences, this archetypal story of a ryuha founder actually fits into Csikszentmihalyi's definition of domain-changing creative individuals, and furnishes a basis for considering martial arts as the product of creativity with a capital C. So important is the story of the divinely-inspired founder, many more modern martial art forms have also adapted this story. In modern media involving popular interpretations of martial arts, the "inspired founder" is reincarnated as an inspiring teacher, for example, Pat Morita's character in the Karate Kid movies, or even Splinter, the rat-teacher of the Teenage Mutant Ninja Turtles. However, this still brings me back to my original question: how does one determine the way in which creativity fits in with the performance of martial arts kata? What does that performance have to do with flow, bound or otherwise? 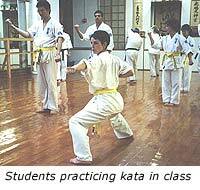 First, we should look at kata as the building block of training. While the origins of kata are unknown, its method of training involves meticulously following a teacher in the exact movements that make up the kata. Generally speaking, martial arts kata involve scenaria of attack and defense, though they are often expanded by arrangement into longer sequences of attacks and defenses from the front, back, and both sides. Students endlessly repeat the movements, over and over, subject to correction by the teacher and senior students. 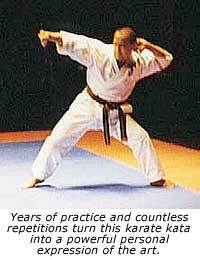 There is nothing magical about the endless repetition of kata practice - it really IS endless repetition. Many more traditional teachers rarely, if ever, offer explanation for what's being done, and are unlikely to let a student progress until certain kata are memorized to their satisfaction, a process that can take years. From the point view of someone not involved in a kata-oriented tradition, this method of learning seems highly formalized, codified, rigid, and dull. Many Western scholars writing about Japanese art forms have expressed their admiration for the fact that such highly formalized art forms like kabuki can still be entertaining (though some writers actually find kabuki performance just as rigid and non-creative as the training). Personally, however, I find many traditional Japanese art forms compelling, theatrical, and very powerful. Given the formal rigidity of kata, how can this be? To consider some of the deeper functions and meanings of kata, I would like to rely on my experience in iaido, the art of drawing the sword. As in kabuki and Japanese classical dance, training for this particular martial art is primarily through kata, since it is difficult to spar with a sword. 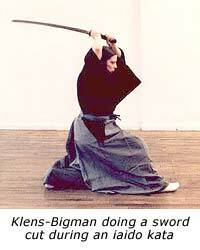 The high level of respect accorded to swords in Japan as well as the extremely dangerous nature of the weapon and techniques being learned make the formality of kata for iaido a compelling necessity. 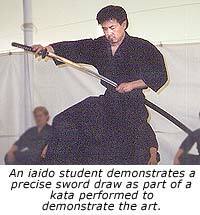 Iaido kata make up not only the learning process of the art form but the content of it as well. In this case kata practice teaches technique, strategy, and perhaps, after many years of practice, the underlying principles of iaido. By "underlying principles," I mean the logic of the movement - why the hardworking and divinely inspired developers of the ryuha (school or tradition of teaching) decided to do it THIS way and not THAT way. On the face of it, one might assume that the study of iaido would contribute hugely to an argument for rigidity and lack of creativity. Fuel for this argument can be readily obtained in the way many people, both in Japan and the US, currently practice the art form. Emphasis is relentlessly placed on correcting the smallest details of kata, and larger principles seem to be devalued. However, this is not really the case. After many years of imitating teachers and senior students, practitioners are eventually able to move beyond, or through, technique. All the technical aspects of the kata are still intact and can be seen by observers, but the way in which the kata is performed becomes highly individualized. In our Dojo, we refer to this as "owning the kata." Iaido then goes from being "about as much fun as watching paint dry," as one observer of junior students put it, to an art form that is both beautiful and somewhat daring in its execution (Prough 1996). The Japanese explanation for this progression is "shu-ha-ri." "Shu" means conservative, sometimes interpreted as "tradition" -- the period in which one learns all the kata pertaining to the style by heart. "Ha" means "break," and is often referred to as "breaking with tradition," but I think this is incorrect. Instead, I think "ha" means "breaking through the technique" by actually evolving through it rather than discarding it. "Ri" means "freedom": a state in which the techniques become so embedded in the practitioner that they can be expressed in free-flowing movement. In other words, the beginner is totally immersed in Laban's workman-like bound flow process of learning kata, and eventually moves beyond it to the much less bound flow process of the expert practitioner, ever closer to the creative flow experience. Shu-ha-ri takes a lifetime. My teacher, Yoshiteru Otani (1998), says each phase takes 10 to 15 years to complete. So, with diligent practice, it takes 20 to 30 years to reach Ri, and then, only with some luck. Many practitioners give up out of boredom or frustration before reaching this state, and some, though they practice and practice, never achieve it. On the other hand, technique learned through kata moving through the process of shu-ha-ri can potentially become a springboard for creativity. In this way, iaido training is similar to both Japanese classical dance and kabuki. One dancer with whom I recently spoke suggested that kata is like the Tardis, the phone booth/time travel machine of Dr. Who (I would have suggested Valantino's tent in Son of the Sheik) - it looks small and confined on the outside, but it's endlessly large on the inside (Moss 1998 n.p.). Therefore, when someone tells me that he was bored at a traditional (that is, a non-sport) martial art demonstration, I tell them with some confidence "what you saw was probably not very good," or, else "They were probably beginners;" that is, the practitioners were stuck in shu, a state that has interest for them, but for no one else. In the hands of a master, for example Shibata Kanjuro in kyudo, Nakayama Hakudo in iaido, or even my own teacher, Otani Yoshiteru, these very formalized art forms take on life and expressiveness. Why is kata uniquely suited to these art forms? Why don't people learn as well from technique drills, or from videotape? An argument can be made that kata practice as a teaching method became popular because it acted as a physical encyclopedia, preserving the form from the teachers' to the students' bodies over generations. With the advent of videotape and CD-ROM disks, its use seems less important now that these forms of recording or reproducing movement are available. But this is not the case. In fact, an experienced practitioner can easily pick out the student who has studied from videotape without benefit of a master teacher (2). In contrast, kata practice, with a live teacher, provides a progressive form of "deep learning" which does not seem to be attainable in any other way. Endless repetition in striving to replicate exactly what the teacher is doing, in all its variations, deeply imbeds not only that technique of the art form being learned, but also builds the meaning of the movement being done. The martial arts student is learning not just the content of the curriculum of the style but also the tactics, techniques, and hopefully the underlying principles that make up the particular style of martial art form he or she is studying. Shu-ha-ri is often described as circular, but I think "spiral" might be more accurate: in the beginning, the student's movements are awkward and express nothing so much as his physical self with what he has initially brought in terms of experience to the dojo, to the stage where he becomes expert at imitating his teachers and seniors, to the point where he can once again express himself through this new, codified movement. In terms of the spiral, the student is crossing that point where she began, but unlike the circle, she crosses it at a higher level. (3) In the Laban sense, though still bound, the flow of movement becomes freer and more expressive, approaching the Csikszentmihalyi definition of creative flow. There is simply no way drilling in abstract techniques and sparring for martial arts to create a similar result, though this type of training is considered "more efficient." We are already seeing this in highly sportified forms, where tournament results take precedence over any form of deep learning. The result is legions of students, which is to say quantity, who really have no idea what they're actually doing. This may mean income for the teacher for the present, and the loss of the art form further down the road, as people trained in this method lack the depth imparted by kata training and become bored as a result. For us mere mortals, Csikszentmihalyi concludes "Creativity," by suggesting ways for us to become more creative in our daily lives. He notes that individuals who make time for creative activity, learn to focus, strive to stay disciplined and find a direction to channel focused energy can enrich themselves by being more creative. Dedicated martial artists (or artists of any kind) fit this definition very well. A few extraordinary and innovative martial artists have founded or modernized their arts -- Kano Jigoro (judo), Ueshiba Morihei (aikido), Nakayama Hakudo (iaido) and Funakoshi Gichin (karate-do). Each could be said to have changed his area of study for posterity, and impressed the field, that is, leading teachers, if not in their lifetimes, then certainly afterward. Each was first "deeply steeped in their discipline(s)" of study before they took a unique approach to a situation: how to preserve and perpetuate martial arts in a rapidly modernizing and increasingly forgetful world. 1- Laban divided movement into four elements: weight, space, time and flow, through which he felt virtually every movement could be recorded on paper. Flow, it should be noted, is affiliated with, but separate from, rhythm (beats distinguished by an interval of rest). Pioneering anthropologist Franz Boaz employed a ballerina trained in the method to record movements of work and play of Native American tribes of the Pacific Northwest, though one of the problems with the method is interpretive; i.e. different cultures don't necessarily assign the same values to the elements Laban uses for analysis. Labanotation was also expanded to recording everyday movement and folk dances of peoples around the world. Laban's system of notation was (and still is) used mostly to record dance and choreography. 2- Video tape learning is problematic at best. For one thing, the practitioners are seen in miniature and subtleties of movement cannot be recorded by the speed of the camera. The student who uses tape is also often at a loss when the practitioner turns away from the camera if other angles are not seen. Another problem is the tape is exactly the same, and any depth the living practitioner may have is flattened out. Movements and their origin are easily misinterpreted or missed altogether. Perhaps most importantly, the life span of videos or even CD-ROM are limited; videos by the instability of the recording medium itself, and CD's by the constantly changing technology which makes accessibility a problem after a short span of time. Therefore, individuals who feel they are able to master a set of movements in part because they "have it on tap" are making a mistake on a number of levels. 3-I am indebted to Margaret Thompson Drewal (1992) for the concept of the spiral, rather than a circle, in describing repetition of actions over time. Csikszentmiahlyi, Mihaly1996: Creativity: Flow and the psychology of discovery and invention (New York: Harper Perennial). Drewal, Margaret Thompson1992: Yoruba Ritual: Performers, Play, Agency (Bloomington and Indianapolis: Indiana University Press). Laban, Rudolf1988: The Mastery of Movement (Plymouth, UK: Northcote House). Otani Yoshiteru1998: Interview with the author. Prough, John1996: The Iaido Newsletter (Toronto: Sei do kai Pub. ).